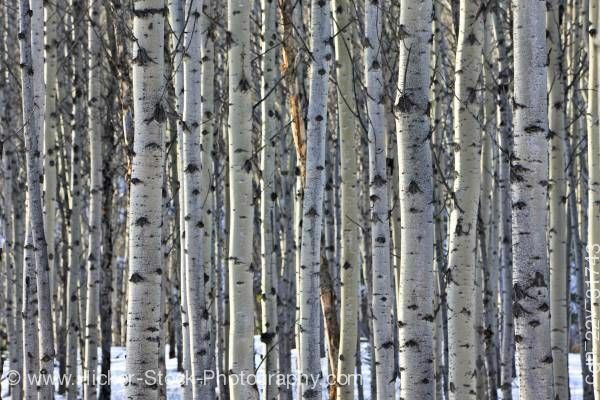 Stock photo of a stand of Aspen trees between Pyramid Lake and Patricia Lake near the town of Jasper, Jasper National Park, Canadian Rocky Mountains, Alberta, Canada. This stock photo includes a stand of Aspen trees between Pyramid Lake and Patricia Lake near the town of Jasper, Jasper National Park, Canadian Rocky Mountains, Alberta, Canada. Jasper National Park forms part of the Canadian Rocky Mountain Parks UNESCO World Heritage Site. The trees in the stand are very closely grouped together but you can see some snow on the ground between them.